Compared to existing emulations, this official app doesn’t bring many new features, but it sounds great and is well implemented. Bender effect is great for adding width and weight. Doesn’t bring much new to the virtual Model D realm, beyond the official branding. The Minimoog Model D is probably the most recognisable synth of all time. Design-wise, its wood-panelled case and three-oscillator architecture make it the quintessential example of a vintage subtractive synthesiser. Sonically too, its meaty bass and piercing leads provided some of the most memorable synth lines of the ’70s and ’80s. 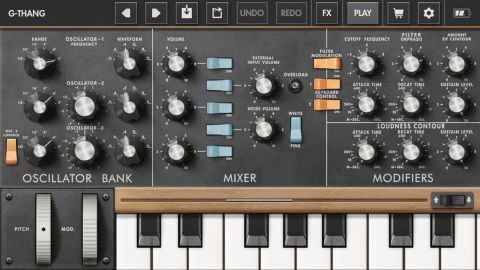 Its ubiquity means that it’s also one of the most commonly emulated synths: most producers probably already have some form of Minimoog-inspired plugin in their arsenal, whether it’s NI’s Monark, Arturia’s Mini V, u-he Diva or some other virtual Model D. Now Moog add an official offering to this pantheon. It lands on iOS, rather than desktop, but even on that platform it’s far from alone - Arturia’s emulation has been available for mobile for almost five years. So does this new version have anything new to offer beyond the official branding? On the feature front, there’s not much that’s unique compared to rival emulations. The Model D App builds on the design of the original hardware with a four-note polyphonic mode, a stereo delay and a - fairly straightforward - arpeggiator, all of which are pretty standard fare for digital Minimoogs. The most interesting new feature is the Bender - a stereo modulation/delay effect with a gritty, analogue-like character and the ability to add considerable weight to sounds. There’s also a built-in audio looper with an unlimited overdub feature. What the app does have going for it, however, is its excellent sound and stella preset library. Despite being a mobile app, Moog’s emulation is easily one of the richest and authentic sounding we’ve tried. The Ladder Filter is as squelchy as you’d hope - although a new ‘clean’ mode is also available - and there’s plenty of low-end power on offer. The app comes stocked with 160 presets, covering classic sounds along with a host of new leads, basses, FX and pads, and the standard is high throughout. Should you wish, you can add more presets by purchasing themed top-up packs. Despite being a mobile app, Moog’s emulation is easily one of the richest and authentic sounding we’ve tried. It also does a good job of interfacing with your wider production setup. It comes with Audiobus, Inter-App Audio and AUv3 support, giving lots of options for running the synth in or alongside other iOS instruments or DAWs. The looper can also export and share audio. There’s Ableton Link support too, allowing the app to wirelessly sync with desktop or mobile devices. The app has exible MIDI controller options, including support for MPE controllers (such as Roli Blocks), and a simple system for assigning MIDI CCs to any interface parameter. Being fussy, we’d like some form of built-in sequencer. There are plenty of options for sequencing from other apps, hardware or a DAW but, given their nature, we like mobile synths to offer a self-contained sketchpad for throwing together on the go. The Looper sort of covers this, but since it captures audio it doesn’t let you capture a pattern and then edit synth parameters while it plays back. That aside, this is a fantastic sounding and sleekly implemented virtual synth at a price that makes it a bit of a no-brainer, even if you already own a rival take on the format.